Millions of people will see that the wriggle is the water bottle of the future – fashionable, powerful, and environmentally conscious. 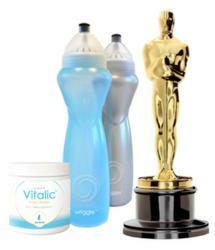 Among the many gifts given to the attendees at this year’s Academy Awards was the gift of better water and better health, as Multipure provided its wriggle™ Portable Filtered Water Bottle as part of the 2012 Oscars’ Gift Suite. The wriggle Portable Filtered Water Bottle launched at Multipure’s Pure Convention on February 24, 2012. It is sold in a set of two bottles (including filters), and each replaceable filter is rated for up to 30 gallons of use. The 84th Annual Academy Awards was held on February 26, 2012. For additional information, contact Vice President of Network Marketing Regina Noriega at rnoriega(at)multipure(dot)com. Founded in 1970, Multipure is an industry leader in the manufacture and distribution of drinking water systems and compressed solid carbon block filters. Headquartered in Las Vegas, Nevada, Multipure employs over 200 people, and is committed to being an eco-friendly company that provides the people of the world with the best quality drinking water at an affordable price. Multipure is a member of the Water Quality Association, the Direct Selling Association, the Las Vegas Chamber of Commerce, and the Better Business Bureau.